You know you’ve been married for a long time when you stop listening politely to your husband’s rotation of stories and stop him after the second syllable with, “It’s on your tape, honey.” It’s comforting to know that this very person knows to amuse my questions after spending way too much time on webMD, “is that little nub on my tongue cancer?” And still we discover and rediscover each other in the day-to-day of our side-by-side living. During a recent lunch at the pasta restaurant in Eataly, my husband and I shared a food epiphany. I know, it’s pasta, what can be new to discover? The answer to this question is a Zen Koan unto itself. The very fact of its simplicity is what makes it complex. What is pasta but flour, water, salt, and in some cases eggs? But what do you with those 3-4 base ingredients can either make your dish sing or just be filler material like the foam in the couch cushion. I had quite possibly the most simple and delicious dish–Cacio e Pepe-it’s literally spaghetti with “cheese and pepper.” Ask a chef or anyone who makes this dish how to prepare it and they will tell you that theirs is the way to make it but press for exact amounts and they will tell you to throw the ingredients into a pot and presto, it’s done. It’s so simple to pull off this dish that cooking Pasta Carbonaro seems like rocket science. So what goes into preparing Cacio Pepe? You’re cooking pasta so you’ll need a large pot of boiling water, heavily salted (3 tablespoon). Then, it’s the spaghetti. Get the good kind. How do you know you’ve got the good kind? You don’t. It’s a trick question. It’s how you treat your spaghetti that’s important. You can get an artisanal pasta made only during the third week of Lent from virgin Piedmontese wheat and fail if you over cook your pasta. So rule number one, undercook your pasta. Cook it to the tooth, al dente, no longer than 3-4 minutes. Before draining the pasta, reserve about 1 cup of the cooking liquid. Drain your pasta and then add it back into the cooking pot. And here’s where everything gets really fuzzy and interesting. Just go with it. Taste and adjust along the way. Start with a few tablespoons of good butter (don’t scrimp on butter! 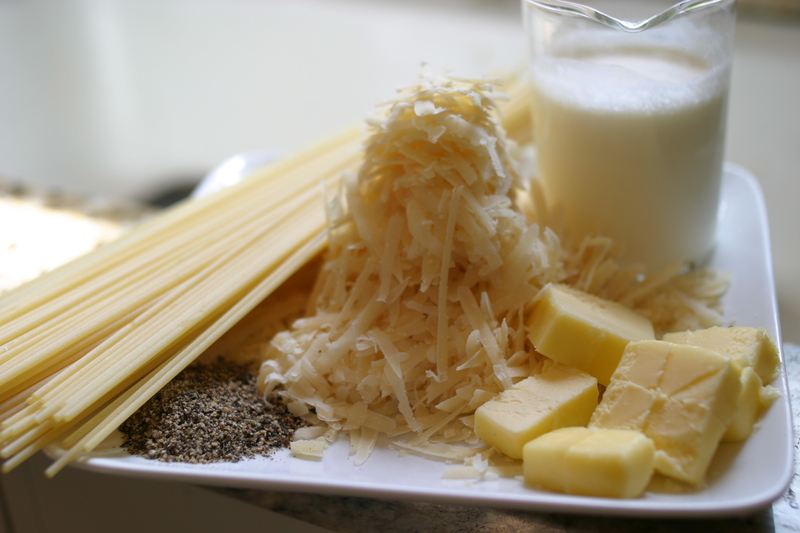 ), then sprinkle in cheese (a Pecorino and either a Parmiagano Reggiano or Grana Padano or other firm grating cheese, preferably a mix of a creamy with a salty cheese). Stir with a wooden spaghetti spoon (the one that looks like a claw). Add a few tablespoons of heavy cream and pasta water. Stir and then add some salt and lots of freshly cracked peppercorn, lots. Then taste and keep tasting and adjusting until you find you’ve hit that perfect pitch. That’s the beauty of the recipe–make it to your taste. For me, I like the spaghetti to be loose, so I’m a little heavy handed on the cream and pasta water. I love to hear slurping when I’m devouring the noodles. Buon appetito! oh yum! Now I have to go do a little research on which is ‘good butter’ – thx for this! Hope to see you in the ‘hood again! Hi EZ! Haven’t seen you and the gang around the nabe lately, but I’ve been following along on your blog, and love the recent posts about the farm visit. A must-try on my list now. About the butter, I really like Vermont Creamery’s cultured butter with sea salt. But there’s an Italian butter that we get from Eataly that is really delicious. I’ll have to find the name for you. Thanks for reading. Keep on bloggin’! !